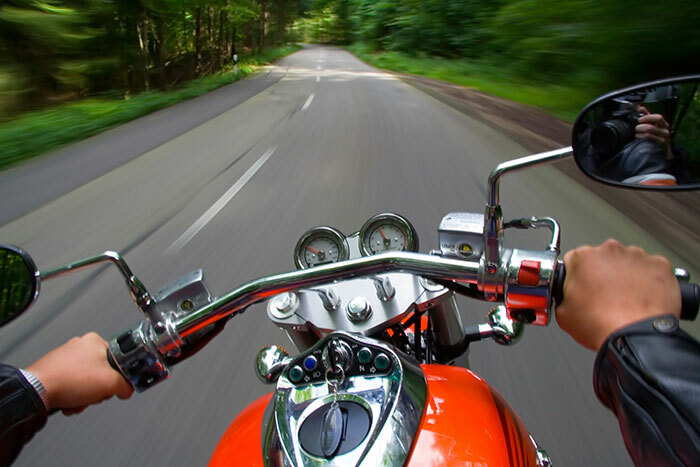 Nestled in the beautiful Blue Ridge Mountains and intersected by one of the most famous scenic highways in the world, the Blue Ridge Parkway, Asheville North Carolina is quickly becoming the hub for motorcycle enthusiasts. Riders from all over the world are finding the eclectic attitude, fantastic cuisine, culture and nearly two dozen microbreweries the perfect amenities to highlight the best mountain motorcycle touring roads in the country. If you’re looking to find a true world-class motorcycling experience, the beauty of western North Carolina and the Smoky Mountains should be on top of the list. 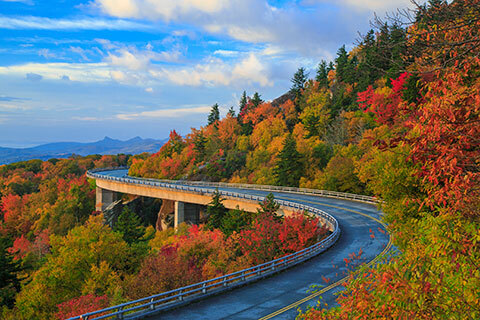 There are a number of great reasons why the Blue Ridge Parkway is so popular to the hundreds of thousands of motorcyclists who make the journey each year… sweeping curves and awe-inspiring views that lead through quaint mountain towns and attractions. The Blue Ridge Parkway Welcome Center is located right on the edge of Asheville and provides a complete history of the scenic road along with the many attractions and local culture of western North Carolina. 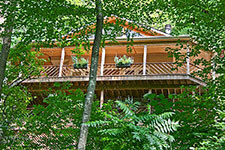 From our Celebration Vacation Home, only 4 miles from the entrance to the Blue Ridge Parkway. 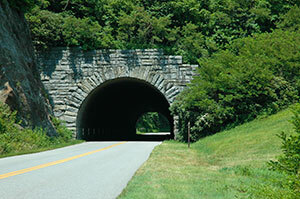 A parkway excursion heading north to Blowing Rock is a great day’s ride with plenty of fantastic stops along the way. The Folk Art Center at mile post 382 is home to 3 galleries, a library and auditorium to showcase the finest in traditional and contemporary craft of the Southern Appalachians. The hiking trails at Craggy Gardens, mile post 364, is where you’ll find some spectacular flora that can only be found atop its 5500 ft elevation. Just a bit further north on the Parkway, you can venture to the top of the highest point east of the Mississippi, Mt. Mitchell which tops out at 6,683 feet! Park your bike at the summit parking lot and take a short paved walk to the lookout platform for the most amazing 360 degree views that stretch for miles. If you’re up for about an hour detour. Once you arrive in Little Switzerland, you can explore NC 80, a stretch of road known as Devils Whip. 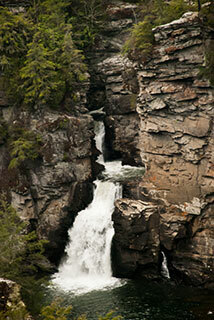 Back from Little Switzerland, your next stop, Linville Falls at mile post 316. These are gorgeous waterfalls coupled with hiking trails from which you can experience incredible views of Linville Gorge. Venture down to explore Linville Caverns for an exhilarating underground tour. The Linn Cove Viaduct at mile post 304 is the engineering marvel of the Blue Ridge Parkway and one which you’re sure to recognize. This 1,234 foot-long s-curve bridge hugs the spectacular Grandfather Mountain and was one of the last sections of the Parkway to be complete. At mile post 305 don’t miss the 2,500 acre nature preserve of Grandfather Mountain. The preserve boasts the famed Mile High Swinging Bridge from which you can capture a selfie unlike another. The park is also known for its wildlife, hiking trails and a Nature Museum and another great attraction to explore. Julian Price Memorial Park at mile post 297 along with its neighboring Moses H. Cone Memorial Park make up the largest public recreational area along the Blue Ridge Parkway. This is just one of the many stops you can enjoy a picnic lunch as you bask in the beauty of the Blue Ridge Mountains. To complete your trip north, we suggest making Blowing Rock your final destination. The town of Blowing Rock is actually named for the actual Blowing Rock, a formation of rock cliff 4,000 feet above sea level, overhanging Johns River Gorge 3,000 feet below. This is one of the oldest attractions along the Parkway. The town of Blowing Rock welcomes in guests with galleries, restaurants and shopping. Rather than back-tracking on the parkway, you may choose to follow Rt 321 to the town of Boone which is home to Appalachian State University. From Boone, circle back through the quaint mountain town of Banner Elk and stop in for a visit to Sugar Mountain Resort or Beech Mountain Resort which offer a variety of events and activities to enjoy during the spring, summer and fall months. Your trip back to Asheville will take you through the towns of Spruce Pine and Burnsville via Rt. 19. From our Celebration Vacation Home, head south to mile marker 393 and The North Carolina Arboretum. The Arboretum is home to a welcome center featuring information on the area’s history of forestry and natural resources along with various exhibits throughout the year. Don’t miss the Bonsai tree exhibit in the greenhouse and explore the manicured hiking trails that wind throughout the beautiful outdoor gardens. As you head south on the Parkway from the Arboretum, you’ll experience a number of historic tunnels that have been carved through this mountainous terrain making for an exciting addition to the many scenic overlooks, trail heads and picnic spots. At mile post 408, you’ll arrive atop Mt Pisgah and the historic Mt Pisgah Inn. The original Inn was opened in 1919 and was a retreat for thousands of travelers who would escape the heat of the lowlands. Development of the modern Pisgah Inn began in 1960 and the original Pisgah Inn was dismantled in 1990 for safety concerns. The Inn’s main attraction is its dining room that features a southern facing wall of windows which frame an incredible view of the Blue Ridge Mountains. Continue south on the Parkway to mile post 469, you’ll arrive at the Cherokee Indian Reservation. Experience the rich culture of the Eastern Band of the Cherokee Indians. Here you’ll find the Museum of the Cherokee Indian, the fascinating Qualla Arts & Crafts Mutual Inc., the renovated Oconaluftee Indian Village and the fabulous outdoor drama, Unto These Hills. From Mile Post 411 south on 276, you’ll enjoy a winding two lane road through Pisgah Forest. Stop in The Cradle of Forestry, which commemorates the beginning of forestry conservation in the United States. Here, in 1898, chief forester for George Vanderbilt’s Biltmore Estate, founded the Biltmore Forestry School, the first forestry school in America. Further down 276 you’ll come to Looking Glass Falls, a beautiful 60 foot waterfall where visitors can pull off and view from the road’s lookout area. You can also take a quick detour off 276 to the Pisgah Forest Fish Hatchery to see how they farm trout that fill the area’s many blue ribbon trout streams. Head down into the quaint mountain town of Brevard, NC. Spend the afternoon shopping, grab some locally made Gelato at Kiwi Gelato or take a tour of the Oskar Blues East Coast Brewery. From Brevard, you can head West on Rosman Highway which is another great 30 mile ride that goes through the beautiful Lake Toxaway leading to the beautiful town of Highlands and Cashiers. Circle back toward Asheville on Route 107 north, a great winding road that leads to the town of Cullowhee and home to Western Carolina University. As you head back toward Asheville on us Rt. 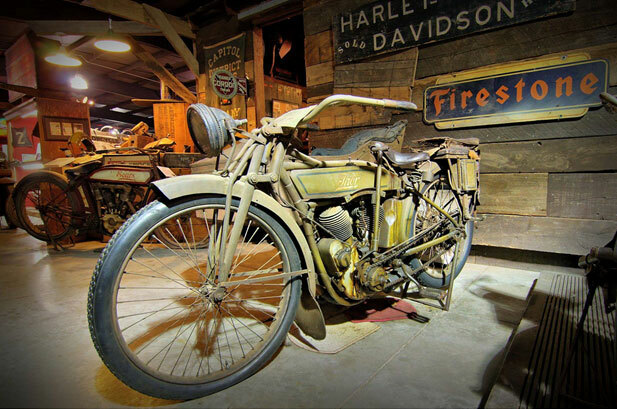 23 east, you won’t want to miss the town of Maggie Valley and The Wheels through Time Motorcycle Museum. This is a must see for anyone who loves vintage American motorcycles featuring the world’s premier collection of more than 300 rare motorcycles. Blue Bird Cove Lodge and Guest Cabin is the perfect property for motorcycling groups of up to 10 guests and is situated in an ideal location for great rides from Hot Springs to the Parkway. 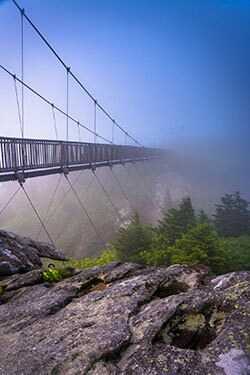 Hot Springs is a popular stop for the through hikers of the Appalachian Trail as it intersects the town. The town caters to the hiking clientele with an outfitter shop, local restaurants, shops and a Post office where many hikers pick up their supplies as they continue on their journey. But one of the main attractions of Hot Springs are the natural hot mineral baths of Hot Springs Resort Spa. This is where the town namesake rises up from the aquifers below and fills tubs with healing mineral waters that are piped into Jacuzzi tubs and drained and sanitized following each use for guests to enjoy. Rent one of their mineral baths for an hour or two and relax your muscles from the mountain ride. After some time explore the town, head south on 209 for a twisting and turning mountain road that winds through farmlands and drops you down into the town of Lake Junaluska. From there you can visit the quaint town of Waynesville on your way south on 276 which climbs up into the Pisgah National Forest and intersects the Blue Ridge Parkway. 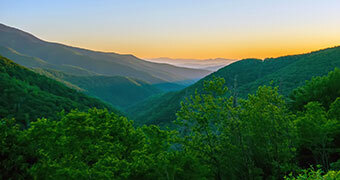 Head back north on the parkway stopping to visit the Pisgah Inn and enjoy the scenic Mt. Pisgah. Then head back north on the Parkway into Asheville to enjoy the many shops, breweries and eclectic ambiance of this great mountain town. 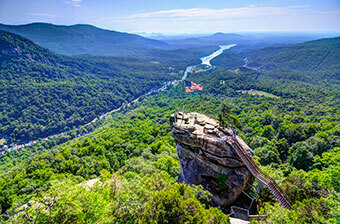 In 2007, the privately owned Chimney Rock Park was purchase by the state and is now Chimney Rock State Park. Not only is this one of the state’s most unique parks featuring hiking trails to the top of the Chimney, a unique rock outcropping overlooking Lake Lure below, Chimney Rock and Lake Lure is a fantastic stop along a southwestern motorcycle day tour. 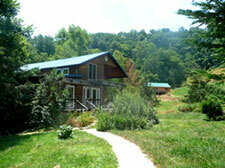 From our beautiful Asheville Chalet, just north of Swannanoa, head south on Rt 74 through Fairview and Hickory Nut Gorge. At the base of the curvy mountain pass which leads you into Chimney Rock, you’ll find Hickory Nut Gap Farms. This is a working farm which is open to the public for daily tours. Hickory Nut Gap Farms one of the area’s local purveyors of that provides organically grown meats many of Asheville’s farm-to-table restaurants. As you continue your ride down the Gorge, you’ll notice the beautiful mountain stream that parallels Rt. 70. Local artists and unique shops are speckled throughout the drive where you’ll find unique crafts and gifts and give you an excuse to pull off and enjoy this scenic mountain river. As you arrive in the town of Chimney Rock, you’ll notice a number of locations that welcome bikers touring the area. Grab a bite at one of the many restaurants, tour Chimney Rock Park or just stroll along the scenic river walk. Further down Rt 70 you’ll find Lake Lure. This scenic mountain lake offers pontoon boat tours where you’ll experience a unique perspective of Hickory Nut Gorge and its beautiful rock cliffs that line the banks of Lake Lure. Follow Rt. 9 south out of Lake Lure, another scenic mountain route connecting you to 176 north which leads into the town of Flat Rock. Flat Rock is a quiet little community where you can visit the home of the Pulitzer Prize winning author and poet, Carl Sandburg. This is a beautifully maintain historic home run by the National Park Service to provide a complete history lesson of the amazing life of Carl Sandburg. Explore the hiking trails that wind throughout this sprawling estate and farmhouse. From Flat Rock follow Rt 64 East to Bat Cave. Apple orchards line Rt 64 which intersects Rt 74 at Bat Cave. Follow Rt 9 North to Black Mountain. Black Mountain is a quaint mountain town with an eclectic mix of shops, restaurants and coffee shops. After spending time exploring Black Mountain, it’s a short 20 minute ride back to Asheville. The Cherohala Skyway is a National Scenic Byway that opened in 1996. The road cost over 100 million dollars to construct. The Cherohala Skyway crosses through the Cherokee National Forest in Tennessee and the Nantahala National Forest in North Carolina. The name "Cherohala" comes from the names of the two National Forests: "Chero” from the Cherokee and "hala” from the Nantahala. The Cherohala Skyway is located in southeast Tennessee and southwest North Carolina. The Skyway connects Tellico Plains, Tennessee, with Robbinsville, North Carolina, and is about 40+ miles long. The Cherohala Skyway is a wide, paved 2-laned road maintained by the Tennessee Department of Transportation and the North Carolina Department of Transportation. The elevations range from 900 feet above sea level at the Tellico River in Tennessee to over 5400 feet above sea level at the Tennessee-North Carolina state line at Haw Knob. Tail of the Dragon at Deals Gap. The crown jewel of any motorcyclist’s trip to western North Carolina has to be The Tail of the Dragon. Located approximately 2 hours west of Asheville, just west of Cherokee, this 11 mile section of scenic mountain road attracts riders from all over the world. From Asheville you can follow Rt. 19/23 west through Maggie Valley and on to Cherokee then follow Route 129 North. With 318 curves bordering the Great Smoky Mountains and Cherokee National Forest, Tail of the Dragon has no intersecting roads or driveways to hamper your travels, just continuous 11 miles of curves throughout some of the most scenic mountains in the east. But beware… The Tail of the Dragon is also not for the faint of heart. With tight turns and thousands of bikers and sports car fans visiting each year, it takes a well-seasoned rider to navigate the Tail of the Dragon. If you can ride it, we guarantee, this will be a ride to remember! The other 'must see' when touring the Tail of the Dragon is Lake Fontana Village. The Fontana Lake Dam, at 480 feet high, is the tallest dam in the Eastern United States. At the time of construction, in the early 1940s, Fontana dam was the fourth highest dam in the world. A ride across the scenic Fontana Lake Dam is a photo opportunity that few can claim! Moonshiner 28 is another great mountain road where you can miss some of the crowds of Tail of the Dragon, but enjoy just as many curves. This tour will take you south through the town of Highlands and Franklin and ending up in the South Carolina town of Wahalla. At one time, this road was known for a place where moonshiners of the smokys would be chased by the revenuers but now is the place for motorcyclists to enjoy great vistas, seclude lakes and plenty of spectacular waterfalls. At Asheville Connections, we offer perfect lodging options for riders to make as their basecamp with spacious, luxury homes just off the Blue Ridge Parkway and close to the many attractions downtown Asheville has to offer. After a day’s ride, return to relax in luxury and comfort as you plan your next day’s adventure. The Asheville Chalet is in a peaceful private setting within 6 minutes of the Blue Ridge Parkway and 15 minutes to downtown Asheville. Just off the covered deck with its hot tub is a lovely waterfall feature to enjoy and the upscale décor is great for 3 couples who will each have their own private bathroom. The wide paved driveway up to the house ends with a flat area for parking with space for 3 bikes and one vehicle. The Celebration Vacation Home is a tasteful and convenient 3 bedroom 2.5 bathroom home. On 20 heavily wooded acres, even with another house or two visible through the trees you’ll enjoy a private setting. 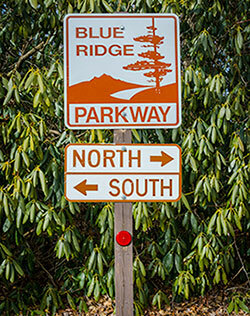 The Blue Ridge Parkway entrance is 4 minutes away and top restaurants and grocery stores are almost across the street. The Biltmore Estate and Biltmore Village are an easy 6 minute drive. Dancing Waters on the southwest side of Asheville has great privacy, a hot tub on the deck, a king bedroom, queen bedroom, twin bedroom and extra double bed and twin bed upstairs. 2.5 bathrooms and a fun game room with foosball and ping pong. This fun house overlooks the mountains and a creek where you might enjoy building a campfire. The paved driveway is short but a bit steep and there’s a carport for pulling under in rainy weather. 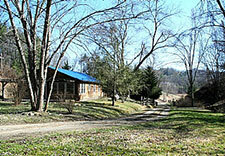 Bluebird Cove Lodge and Bluebird Cove Guest Cottage offer a total of 5 bedrooms in two different houses side by side within 5 minutes of great touring near the Marshall outside Asheville. The 3 bedroom house has a hot tub on the deck and wonderful serenity out in the country. 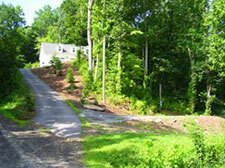 About ½ mile just off a paved country road, the flat dirt access road takes you through the gate and onto the property. You might see or hear the cows slowly plodding down to the creek for a drink of water behind the house on the other side of the fenced in back yard.